WHBQ TV brought disc jockey Dewey Phillips to local TV in 1956, hosting an afternoon teen dance show titled ''Pop Shop''. 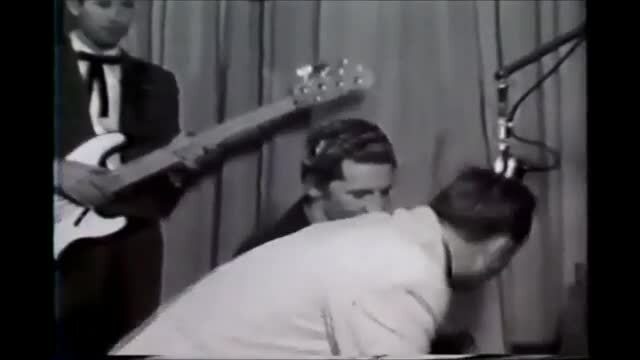 This is a filmed bit of the show (minus music) from around 1957 with Jerry Lee Lewis. His remark about "Lansky's" refers to Lansky Brothers, the Memphis haberdasher beloved by the black community in Memphis and by Elvis Presley and others. For some reason, this clip omitted Lewis's actual performances. In 1958 WHBQ TV, an ABC affiliate began broadcasting American Bandstand in the afternoon slot, foolishly moving ''Pop Shop'', renamed ''Night Beat'', to 11:30 PM. It didn't matter. Within a few days, the show was canceled after one of Dewey's screwball on-air sidekicks inappropriately groped a cardboard cutout of Jayne Mansfield on-camera. What ended ''Red Hot & Blue'' was way more insidious: the rise of Top 40 radio. Even at WHBQ, owned by a New York corporation, independent jocks like Dewey Phillips became expendable, one small step on the road to the current horrors of Clear Channel and other current mega broadcasters. Unable to follow the tight, set Top 40 format, late in 1958, WHBQ parted ways with him. His fans literally wept in the streets of Memphis during his final broadcast. DEWEY MILLS PHILLIPS - Memphis disc jockey for 56 WHBQ radio, located at 272 South Main, Memphis, Tennessee, who on his program "Red Hot and Blue", on July 7, 1954, first played an Elvis Presley song on radio. (Dewey Phillips was not only the first disc jockey to play an Elvis Presley record, he was the first disc jockey to play a Sun Record, when on March 1, 1952, he aired the first record released commercially by Sun Records. The record was "Blues In My Condition"/ "Sellin' My Whisky", SUN 174 by Jackie Boy and Little Walter). By the mid-1950s, though, the babysitter's main task was to protect Dewey from his fans. He had become as big a star as the musicians whose records he played, and his country hipster comments became instant slang in Memphis: "Anybody wanna buy a duck?". "If you can't drink it, Freeze it and eat it". "That'll get it. That'll flat get it". Dewey Mills Phillips lived of 3330 Macon Road, was discovered by his mother, Mrs. Odessa Phillips at 5 pm. He was 42. Cause of death had not been determined last night. Mr. Phillips had talked briefly with his mother yesterday morning. A saddened Elvis Presley last night said: "I am awfully hurt and feel very sorry about hearing of Dewey's death. We were very good friends and I have always appreciated everything he did for me in helping me in my career in the early days". After the movie he raced to WHBQ radio studios to hear that the telephone lines to the studio had been jammed. The callers wanted the record played over hundreds of times. He gave his first interview to Mr. Phillips that night.